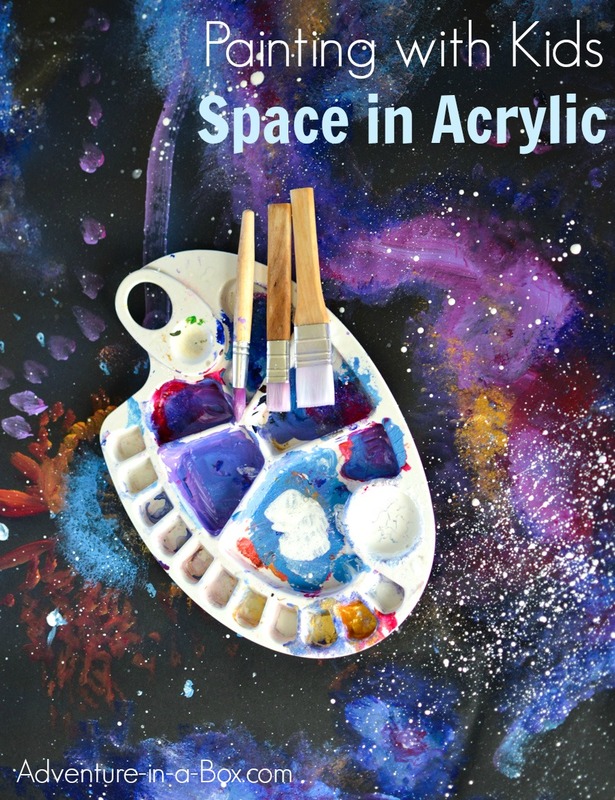 Learn how to paint space with acrylics in a simple way that even children can accomplish! 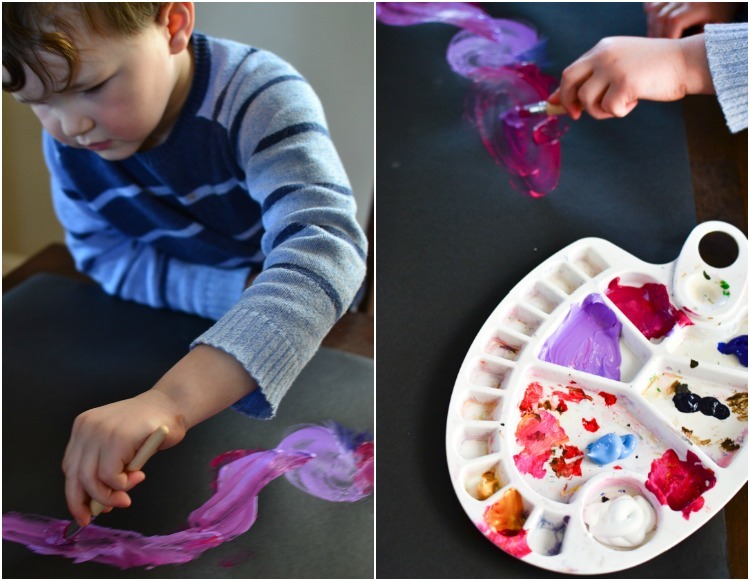 This technique works for creating beautiful abstract wall art and decorating craft projects. 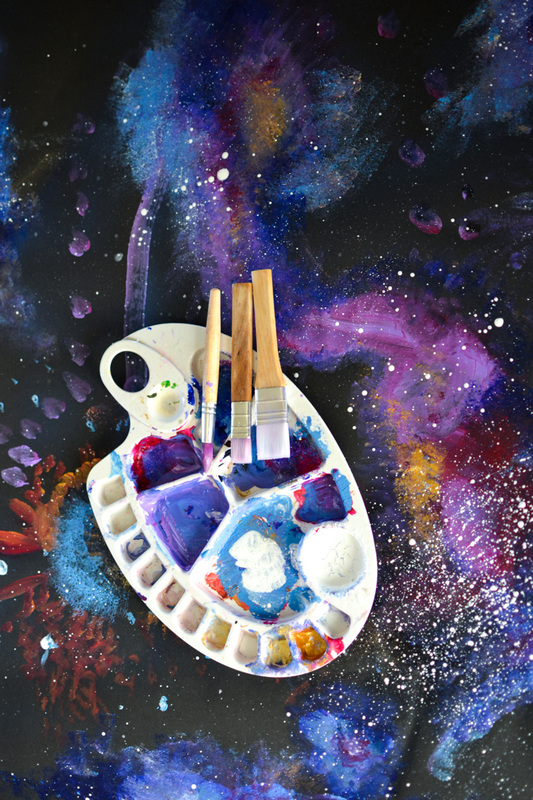 If you’ve been around this blog for a while, you might have noticed that we have a fondness for painting the cosmos. Our whole family does. For one thing, it’s beautiful. Gorgeous nebulae and breathtaking galaxies, who can resist those? Not even my son, who is four at the moment. For another reason, it’s actually quite simple to paint. 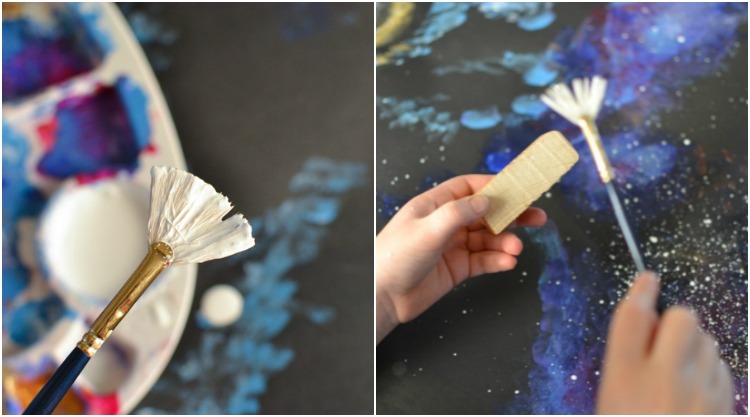 In my opinion, there are a few secrets involved, and we’ve used them in a variety of projects : for making space Easter eggs, a space cutting board for Mother’s Day, and finally some space Christmas ornaments last year. A few months back, for his birthday that already featured a space cake, I decided to paint a quick poster of space. The plan was to throw some paint on black paper and then add splashes of white for stars. The painting would act as a centre piece of a kind, and then we would offer all the kids to work on it and create a big space painting. But when I started painting it (just a couple of hours before the party, obviously! ), my son joined in. Then I saw how easy it was for him to paint space with me. He would mix colours around, using paper like a palette, but it all looked good in the end. The activity was also a hit, and he liked it especially much! Since then, we did five or six more space paintings. 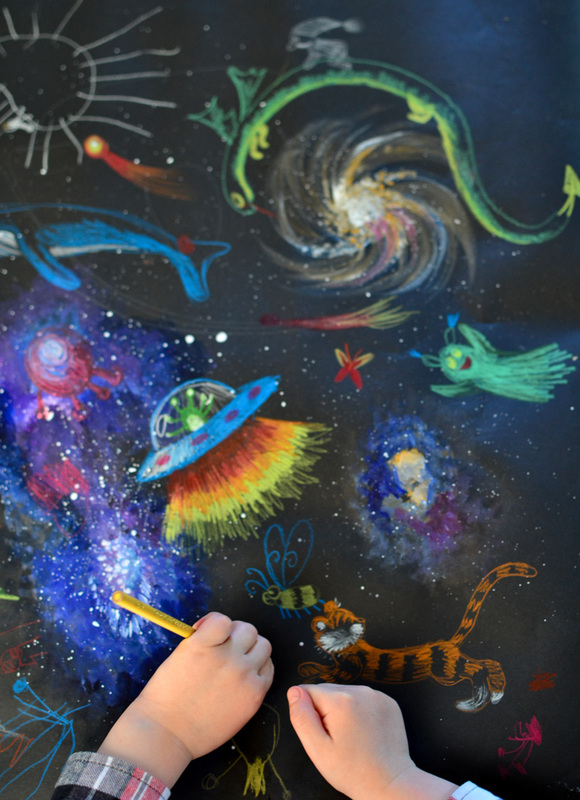 We’d paint cosmos first, and after the picture is dry, he would decorate it with aliens and spaceships. There are definitely a few tricks you can try, but the technique is simple, and you can use it for painting on wood, canvas and even aprons! We did a space apron for Father’s Day last year. If you look for photos of space, you will see that it is miraculously vibrant. Choosing colours is important. Especially with little kids, you want to eliminate the ones that you will not need and make sure that you have plenty of violet, magenta, and two or three hues of blue. A little bit of golden will take you a long way, but you could also use ochre or yellow instead. Look up pictures of nebulae to see splashes of golden and light blue! Use the very minimum amount of water possible – or no water at all. The excess of it will wrinkle the paper and make colours too translucent to show well on black. 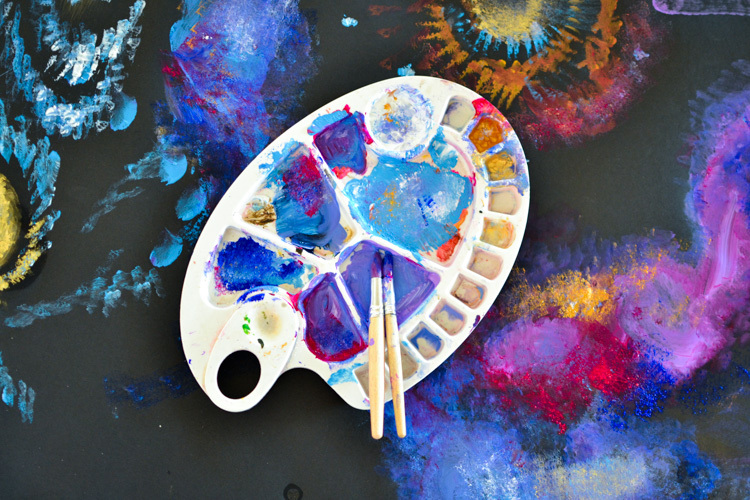 You can do abstract painting with clouds of purple and blue or find references of different objects in space and try to represent them. Here is the creation of a spiral galaxy that Dad did. Tip # 2: Sponge It! A sponge is my favourite tool when it comes to covering big surfaces with acrylic. I used it for our recyclable castle and for our toy barn as well, because the texture is a lot more interesting than that of a brush. 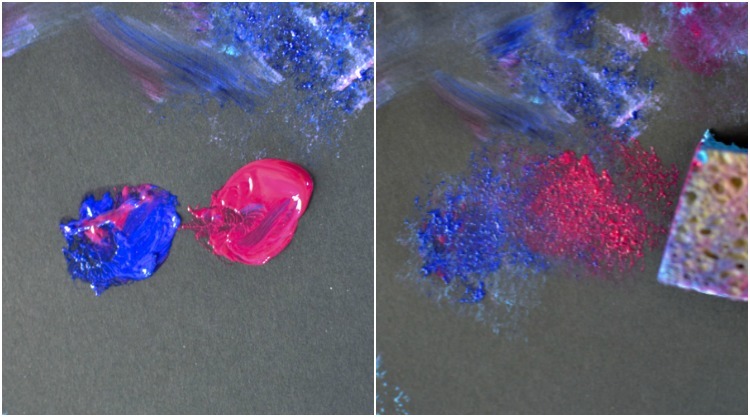 When used for mixing colours, a sponge also gives an interesting effect. 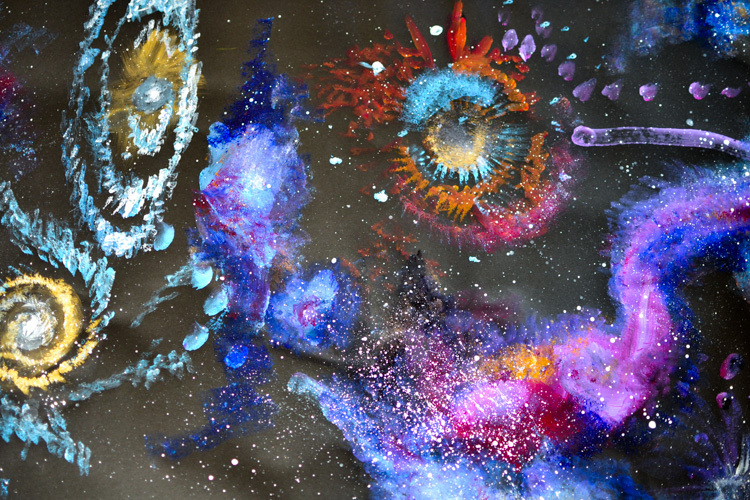 I like how it spreads the colours at the edges, and if you watch the video of me painting, you’ll see that I used it on the edges of galaxies to blend them into the black background. This is a cellulose sponge for washing dishes, except, of course, I haven’t used this particular piece for that purpose. I usually cut a sponge in 6-9 little pieces. They can be reused if washed right after painting. 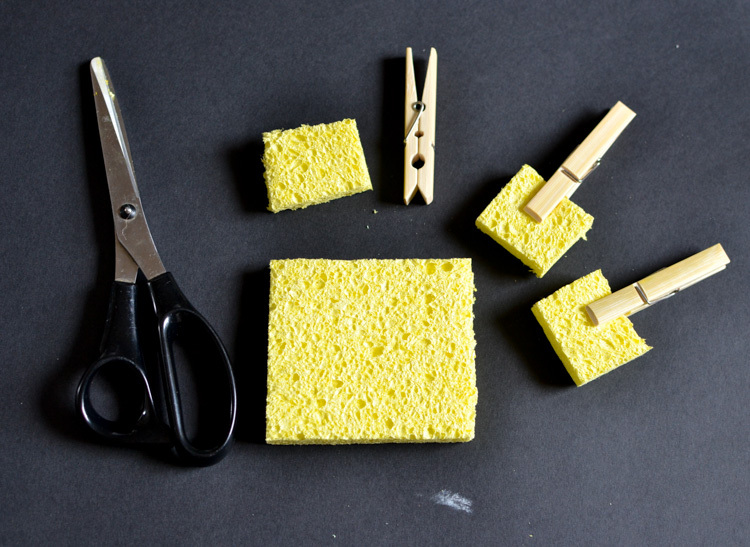 If you have some clothes pegs around, you can even create your own sponge brushes. If not, I often just hold them carefully in my fingers, but that isn’t ideal for kids. Once we’re done painting and sponging and mixing colours, this is what we’re left with. Reminds me of a big palette! At least, the parts that my son and I did. Dad’s nebula is recognizable at the top. If you wonder, the project up to this stage took us about 20-30 minutes, which isn’t long even to the attention of a four-year-old. But I don’t know how much it looks like space?.. So, next we take white paint and dilute it with water. Then we take a brush and something else – an old wooden block, another brush or a pencil, anything. We flick the brush against the other object, and it splatters little white dots everywhere. My son uses a fan brush here, but it doesn’t really matter. They come out in different diameters and look as randomly spaced as stars. And this is how this painting turned out when finished. It’s about 2×5 ft, so there is a lot of space for adding planets and spaceships! And here is one of our previous paintings that Anselm and I already decorated with spaceships, aliens and spacetigers. 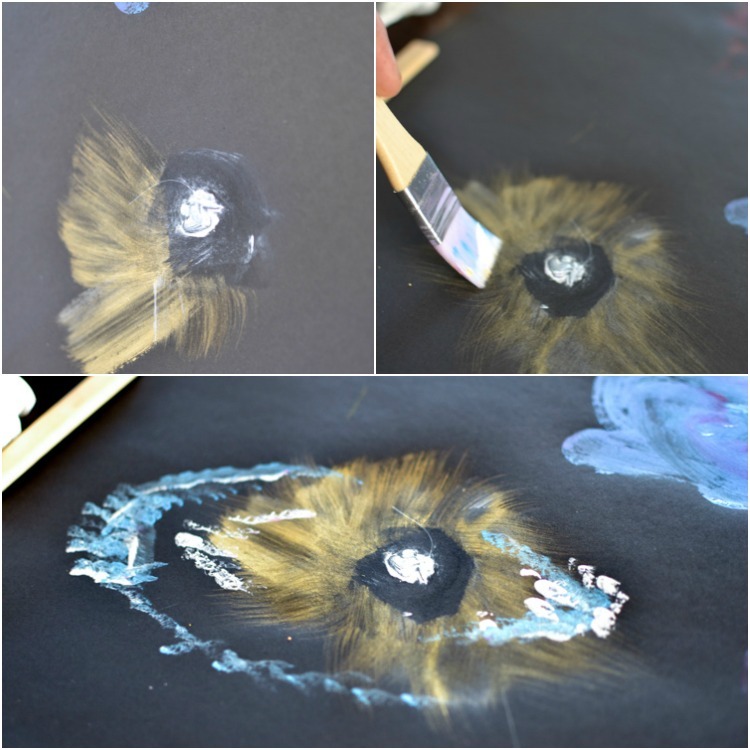 Since acrylics are really versatile paints, you can try this technique on many different surfaces – cardboard, canvas, other fabric and wood! You can paint t-shirts, or sneakers, or cutting boards.